So much yarn, so little time. : email signatures - don't hide under a cloak of invisibility! email signatures - don't hide under a cloak of invisibility! 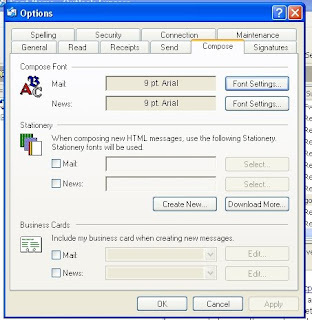 I blogged yesterday about my email siggy - I don't want any of my contacts to not know what I do. Big thanks to Anke for adding extra details for other email users. I choose to just use text, because I know many people have picture sigs blocked as part of their security protocol. Indeed, I often get mail myself that says "pictures blocked"...so I'm one of them. Select Tools, then Options as before. Next, select Compose. You're going to create "Stationery". 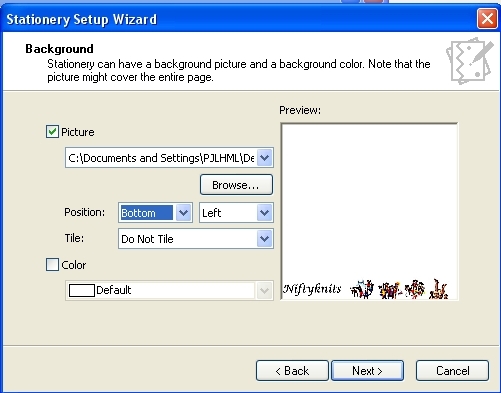 Click in "Mail" and "Create New" and the Stationery Wizard will open. Click next - mine then shows the first available picture that is pre-loaded. 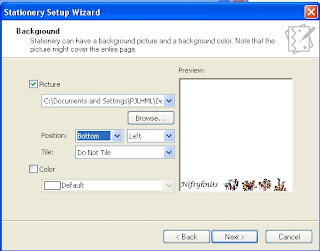 To choose your own picture - for instance, your online shop banner - click Browse and go to wherever you've saved your banner to select it. 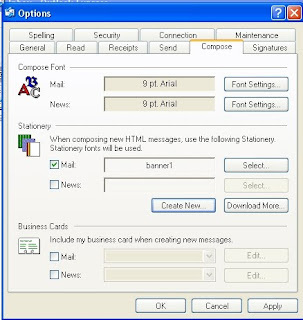 Click next - you will now be asked to select the font you will use for your emails. 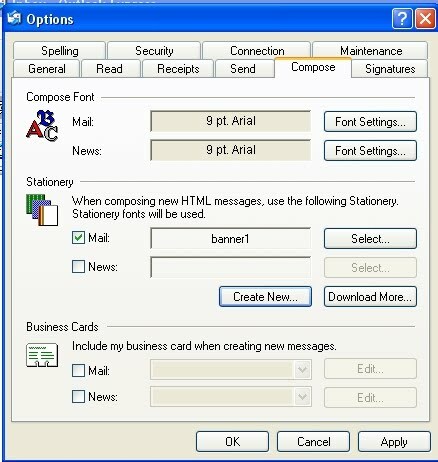 Be aware that if you choose an unusual font, it will only actually work if the recipients have also installed that font. 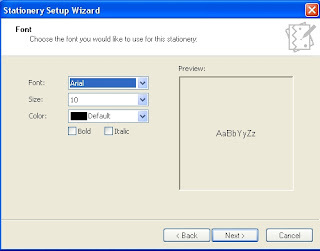 If they haven't, they will see the email in whatever their "standard" font is - that's why I stick with Arial. 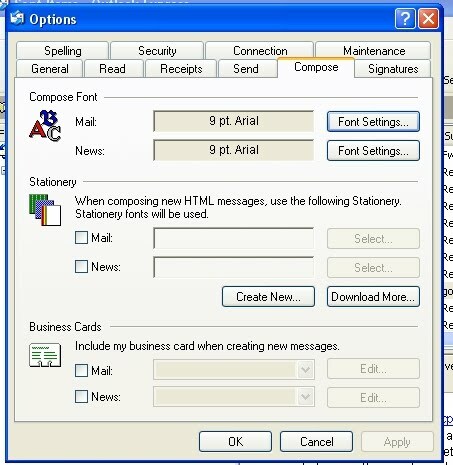 Your emails will now automatically be written on your beautiful new stationery! 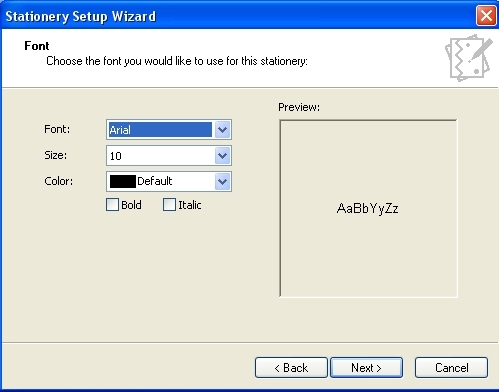 If you have also created a text signature, you will need to make sure either that they are in different positions (eg picture on stationery at the top, text signature at the bottom) or choose between them...otherwise, like me on my first attempt, you might end up having them on top of each other! As I said yesterday, if you use a different email system, remember Google is your friend. There are loads of free tutorials out there!